The unit I have here is made by Mapower and is simply called the MAP-63C. You get the plastic enclosure, with an IDE cable inside, a 6 foot USB cable outside and a little power adapter that converts 110 AC to 12V and 5V DC that plugs in anywhere using a simple power supply power cord (the same kind your PC and monitor uses for power). Certainly, it is unfortunate that the unit has to be plugged into the wall, but keep in mind that USB only provides 5V, and a hard drive requires both 12V as well as 5V. The drive looks pretty cool, although "blueberry" (this is the name that Mapower gives the color) is the only color it comes in. Purple and green would be cool, but blue is fairly neutral and easy on most eyes. 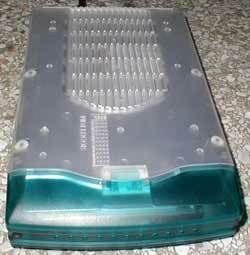 The main part of the shell is clear and a metal shield that covers the actual hard drive can be seen inside. The edges are very well rounded making the unit very subtle and not too obtrusive. Inside the unit, I bolted in an old Western Digital 7200 RPM 20GB drive that I had laying around. This required some mechanical inclination in itself. The instructions on the box tell us to remove the "blueberry" colored faceplate and THEN separate the halves. This doesn't work this way at all. Fact is; one needs to unscrew four screws out of the back of the drive and spread out the halves of the shell like a butterfly. This exposes the metal plate that the hard drive can be bolted to. Screws are included. I set the jumper on my drive to 'single' and bolted it in place. I plugged in the power and the IDE ribbon cable, and bolted the cover back on. In Windows 98, I had to install the included CD to install drivers for the OnSpec USB adapter. In Windows ME, a native "USB Mass Storage Device" driver and the hard drive was picked up as a WD 20-5BA. 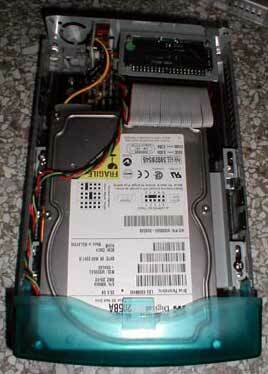 In Windows XP, a native OnSpec USB adapter installed and the hard drive was picked up as a WD 20-5BA.